Grandma is sure to love showing off her grandchildren on this sweet and colorful Personalized Sweatshirt for Her. Make it a one of a kind gif she will enjoy time and time again. 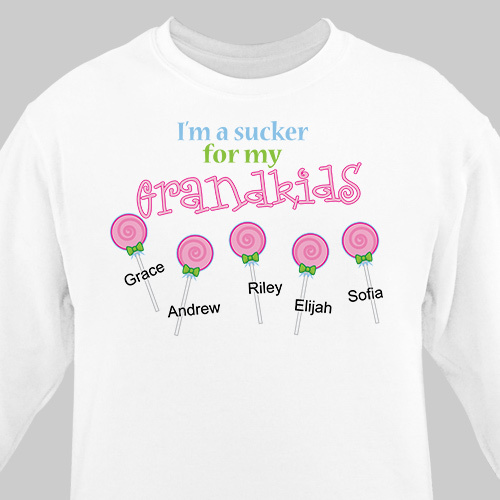 Our Personalized Sucker for My Kids Sweatshirt is available on our premium cotton/poly blend white, pink or ash gray sweatshirt, machine washable in adult sizes S-3XL. Free personalization is included. We will personalize this sweatshirt with any title, such as grandchildren, children, nieces, nephews or any title that you choose & we can add up to 12 of their names. Also makes a one-of-a-kind Mother’s Day Gift Idea. Example: "Grandchildren, Daughters, Children, etc." Additional Details Custom Printed Sweatshirts make heartwarming gifts for grandparents, parents, aunts, uncles or anyone on your shopping list. Shop fun designs like our Personalized My Heart Belongs To Sweatshirt & our Custom Printed God Couldn't Be Everywhere Sweatshirt as well.